Updated Saturday December 1, 2018 by Greenwich Village Little League. Effective January 1, 2018, Little League of America has adopted the USA Baseball bat standard. Very simply put: only bats bearing the USA Baseball logo on it are approved for use in Little League games. This may mean that bats you have previously purchased will not be allowed in games. To read more about this bat standard and check to see if any bats you own are eligible, click here. This does not mean that you must go out and purchase a new bat. Every team is being issued one LLoA-approved bat for their use. 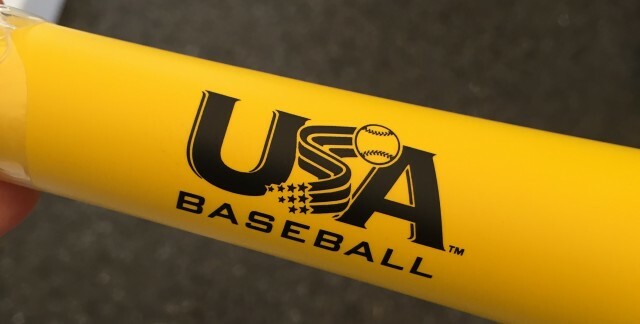 If you do want to purchase a new bat, you should make sure it conforms to the standard and bears the USA Baseball logo (please see the image above). Note that wood bats (if of the correct size) are eligible even if they don't have the logo. More information is available at the link above. While in past years GVLL had implemented a more restrictive bat rule than LLoA and disallowed "composite" bats that were otherwise valid in Little League, the league has decided to fully adopt the LLoA rule at this point. If a bat bears the USA Baseball logo, it is valid for use in GVLL. If you have any questions or concerns, please reach out to your team manager.